It is super important to keep your feeders clean, especially in the spring and fall when so many birds are migrating through mid-Michigan. The stress can make birds vulnerable to disease. Wet weather can also produce mold and mildew which can be fatal to birds. 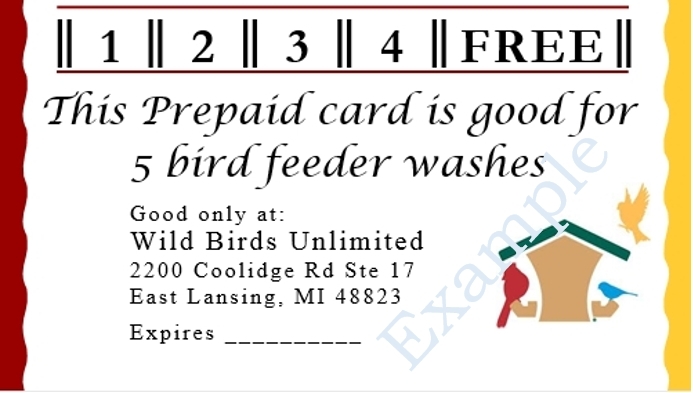 Wild Birds Unlimited in East Lansing can help you make keeping your feeder clean easy. We wash feeders year round for a small charge of $5.00. We will disassemble, soak, scrub, and reassemble your feeder and have it ready for you the next day we are open. 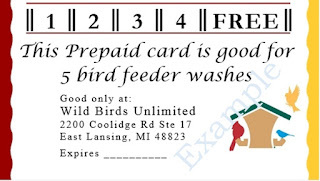 Or we also offer the Bird Feeder Wash Card. You just prepay $20.00 and you will receive a card that is good for 5 washes. This will give you a savings of $5.00! And I recommend Feeder Fresh very highly. I use it myself in bad weather. It is a descant that you add to the seed when you fill the feeder. It absorbs excess water, is safe for birds, and made from non-toxic absorbent sand. 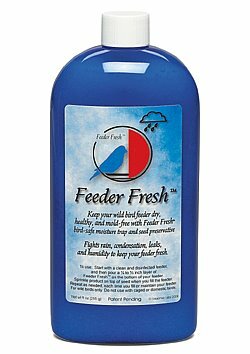 I use Feeder Fresh a lot in wet weather. It keeps my feeders free of mold which makes it easier for me to maintain clean healthy feeders.